with the illustrator of the series. He is pretty funny!!!! I hope you enjoy the interview...and don't forget about the chance to win the Pout-Pout series!!!!! Leave a comment with a 2 or 3 sentence description of a fish lesson you use in your classroom! I'll draw a name from those who do this...and the winner will receive a complete set of The Pout Pout Fish Books! Please "Like" Art With Mr. E on Facebook & "Follow" me on Twitter to see if your name is selected!!! 1) What was your early inspiration for creating art/illustrations? My childhood bedroom wall and a box of crayons. There are so many things that have inspired me: other artists, picture books that I read when I was a kid, comics, nature and on and on and on… In particular, "The Far Side" single panel comic was one of my favorites when I was younger and one of Gary Larson's anthologies was called "The Prehistory of the Far Side". It showed his rough ideas before he would clean them up. This was an epiphany for me because his scribbles looked just like my scribbles and it was the first time I remember thinking "I can do this!" 2) How does your personal art and illustration differ? Do they influence each other? They can't be in the same room together. My personal art thinks that my illustration art is childish and my illustration art thinks that my personal art is narcissistic and a waste of time. Only after many interventions and couples counseling sessions have I finally gotten them to start working together. 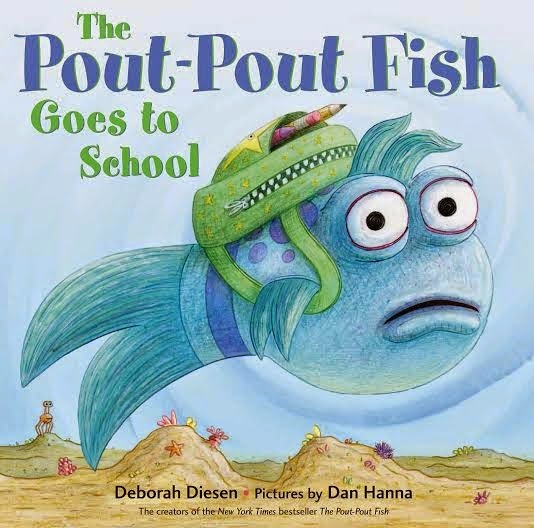 Actually my personal art is more experimental and my approach with "The Pout-Pout Fish" books derives from some of my more successful experiments. I used to draw more carefully and deliberately but the results would often look lifeless. At one point I made an effort to loosen up my style by starting off with scribblier scribbles. I've found that these small, quick scribbles ultimately lead to drawings that feel more lively and humorous and which surprisingly have better structure. I've also learned that I get better results if I don't draw from reference images. I'll usually do a bit of research but then I'll just draw based on my faulty memory. There is something about mistakes and misinterpretations that tickle the mind. As a child I remember noticing that the game of telephone often produced a result that was far more interesting than the source. If you're building a bridge then mistakes are probably something to be avoided. But if you're an artist, a mistake can be an adventurous friend who takes you to fantastic, out of the way places, that you'd never have thought to visit on your own. those wanting to get into illustration? Think of pens, pencils and paintbrushes as magic wands. Everything is possible. You can draw a simple rabbit being pulled out of a hat or conjure up entire universes filled with nothing but hat wearing rabbits. To become an illustrator is to become a wizard! You will astound yourself with the fantastic stuff that tumbles out of your head onto a piece of paper. So the next time you pick up a pencil – make some magic happen!